Game 4 is Saturday night in Chicago. Ryan Kesler #17 of the Anaheim Ducks passes the puck as Kris Versteeg #23 of the Chicago Blackhawks defends in Game Three of the Western Conference Finals during the 2015 NHL Stanley Cup Playoffs at the United Center on May 21, 2015 in Chicago, Illinois. Frederik Andersen and the Anaheim Ducks left that grueling Game 2 loss back in Anaheim. They brought their special teams to Chicago. Andersen made 27 saves, helping Anaheim kill off five power plays, and the Ducks beat the Chicago Blackhawks 2-1 on Thursday night for a 2-1 lead in the Western Conference finals. Defenseman Simon Despres scored his first career playoff goal in the second period as top-seeded Anaheim bounced back quite nicely from Tuesday night's triple-overtime loss that included two power-play goals for Chicago. Patrick Maroon also scored for the Ducks, and Ryan Getzlaf had two assists. "This was a character win," coach Bruce Boudreau said. 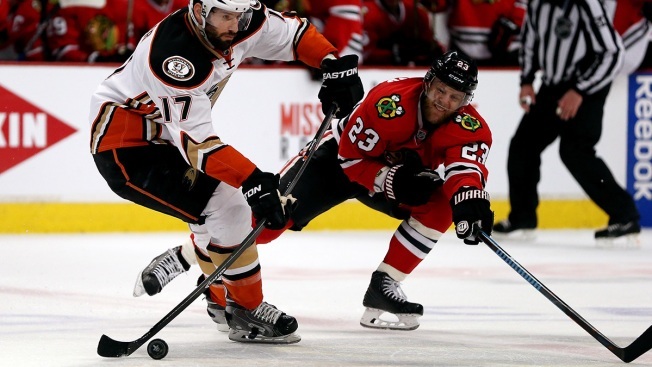 Ryan Kesler's two holding penalties contributed to more than nine power-play minutes for the Blackhawks, but the Ducks' penalty killers kept most of Chicago's opportunities to the outside and Andersen stood his ground during a couple of goalmouth scrums. "Yeah, we just sharpened up on the PK," Andersen said. "We weren't satisfied with what we did the last game. That was huge for this group coming off a tough loss where we gave up two goals on the PK. We wanted to be better today." 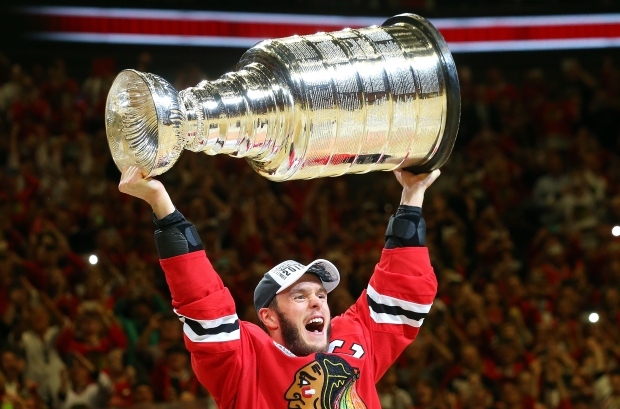 Patrick Kane scored his eighth playoff goal for Chicago, and Corey Crawford made 25 saves. "It's frustrating that we lost, and frustrating because we had some opportunities whether it was the power play or different chances and stuff that would get me back in the game," Kane said. "Other than that, we knew it was going to be a tough series. This is a good team. It's tough to lose, especially at home, but we've got to regroup." The teams were tied at 1 before Despres drove a pass from Getzlaf past Crawford from the right wing with 55 seconds left in the second. Despres came over in a trade with Pittsburgh in March. "It's been a good run so far," Despres said. "We haven't done anything yet. We want to get to the top. It's a team game and the team has been playing very well so far." The Blackhawks outshot the Ducks 10-5 in the third, but couldn't get the tying goal as Andersen continued his great run in the playoffs. Anaheim finished with 27 blocked shots, compared to nine for Chicago. "We have a great team that is willing to sacrifice themselves like that," said Andersen, who has allowed just 23 goals in the Ducks' 10-2 start to the postseason. "It's awesome to have a group of guys like that in front of you. That helps me out a lot." Two days after Chicago's 3-2 victory in Anaheim, the Blackhawks shuffled their lineup while the Ducks went with the same group for Game 3. Forwards Kris Versteeg and Joakim Nordstrom were active, replacing Antoine Vermette and Teuvo Teravainen in a bit of surprise. Versteeg and Nordstrom were mostly quiet in their first action since the first round against Nashville. "We just wanted to get some fresh legs in there," coach Joel Quenneville said. "We felt that Steeger had never played over a long stretch in the last series, we wanted to get him back in there. You know, tough game the other day, travel. We wanted to bring some new guys in." While the Blackhawks struggled on the power play, the Ducks capitalized on their only chance with the man advantage. With Marian Hossa in the box for holding, Maroon tipped Hampus Lindholm's long slap shot past Crawford at 12:55 of the first for a 1-0 lead. Anaheim then killed off a double minor on Jakob Silfverberg for high-sticking, but Chicago tied it at 1 when Kane converted a spinning backhander in the final minute of the first. It was the first point of the series for Kane, who had seven goals and six assists in the first two rounds. The Ducks made a big push at the start of the second, recording eight of the first nine shots on goal. The Blackhawks started to play better midway through the period, but Andersen had a nice stop on an open look for Jonathan Toews at 9:17, and then had an outstanding glove save on Brandon Saad with 1:24 to go.